(you can read more about it here). 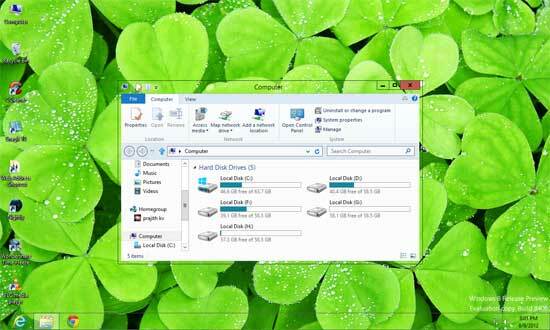 However, if you still fond of Aero Glass UI in Windows 8, there is a little trick to enable it in Windows 8. Step 1: Right-click on Windows 8 desktop and select “Personalize”. Now, select “High Contrast #1”, and then click “Window color” (see screenshot). Do not click “Save changes” or “Apply” options. Step 2: By keeping the above mentioned personalize window open, once again right click on the desktop and choose “Personalize’. Step 3: Now, select a default theme. When complete the process, click on “Save changes” option in the first personalize window and see the changes.